Welcome to 2018! This is my third year selecting a Rune for the year. Two years ago, I chose Thurisaz to reconnect me to the power within me that I had had let slip away through the daily routines of life. Last year, I countered the masculine energy of Thurisaz with Sowilo. It was a nice balance. My 2018 Rune began calling to me in December...in no uncertain terms. It is Ansuz. Ansuz represents many things for me, but the main thrust of this Rune is as it relates to language, wisdom, and communication. Ansuz came to me in December, because I had hoped to finish the draft of the sequel to my novel, The Son of Nine Sisters, by the end of 2017. Due to year-end family commitments, it became apparent in mid-November that that was not going to happen, so I gave myself until the end of January, another deadline that will be missed, though only just. I believe Ansuz came forward to remind me not to lose focus even though my two soft deadlines would pass unmet, and to remind me to stay focused on completing the sequel draft, regardless of missed self-imposed deadlines, and to continue to the next writing project after that. Even though I have known for more than a month that Ansuz would be my 2018 Rune, I still wanted to perform a ritual to recognize it. Last year, I sat with my Runes, holding each one individually in my hands, narrowing it down to Sowilo. When I considered this year's ritual, I saw myself painting Runes. The result is the image above and the process clearly was not about quality painting so much as it was about the process of connecting to my Rune for the year. It's a spatial thing, but it was also a flowing trance-like process. 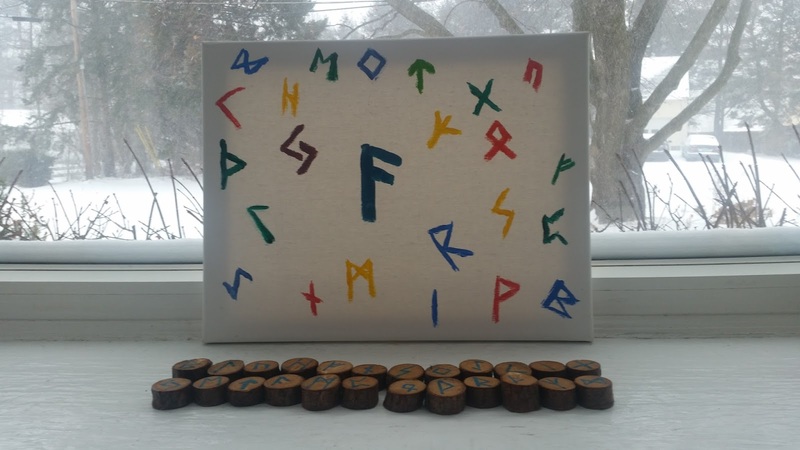 I had a vision in my head that looked very similar to the painting, though I could not see the entire painting in my head; I could see only where individual Runes belonged on it. The ritual was about placing the each Rune in its space as I drew it from the bag. Sitting in my Bay window on this snowy January morning, I drew the Runes, one at a time. (The image below shows the order in which I pulled them.) And, as I drew them, I chose a color that represented that Rune's energy to me and painted the Rune where it was in my image. There was almost no pause during the entire ritual. The resulting visual will serve as my reminder for me this year to not lose focus on the commitment I made to my writing. I will be curious to see how the placement of the other Runes around Ansuz will impact its role as my Rune for the year.